The Molecular Engineering Group seeks to design, synthesize, and study functional macromolecules, in particular π-conjugated molecules. All activities are rooted in organic synthesis. Within the Center for Exploitation of Solar Energy, a special emphasis is on development of new organic molecules for energy storage and photovoltaic. Other important activities are development of redox-active organic molecules for molecular electronics, photoswitchable liquid crystals, and two-dimensional redoxactive carbon-rich sheets and networks. Significant progress with respect to controlling the switching cycles of dihydroazulene/vinylheptafulvene photo-/ thermoswitches has been achieved. 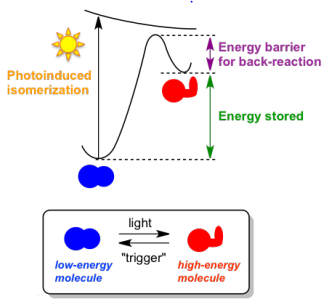 ergoing a photoisomerization re action and release the energy again as heat on demand when needed. We have also developed and synthesized several new functional organic molecules for molecular electronics applications, including new cruciform motifs based on redoxactive tetrathiafulvalene and dithiafulvalene units. With support from FTP, a project on photoswitchable liquid crystals is running. Another project on carbon-rich materials containing redox-active tetrathiafulvalenes is running with support from the Villum Foundation.